Properties for: Nylon Bushing StockLength Tolerences for Nylon bushing stock are Plus 1", Minus 0"
Typically holds tighter tolerences than our hollowrod products, also the superior surface finish means this product can be used "as is" without the need to surface grind or machine. About Nylon What is Nylon? Nylon, commonly referred to as PA (as in polyamide) is a synthetic thermoplastic (a plastic material, that becomes pliable or moldable above a specific temperature and solidifies upon cooling) linear polymer (a large molecule whose components are bound by a particular type of bond.) Nylon is most commonly available in black, white, and its natural color (off white or beige) with a transition temperature, from a hard into a viscous or rubbery state of 220° C / 428° F.
Why is Nylon used so often? Nylon is incredibly useful for applications that require a plastic material with a high melting temperature. Nylon can be adapted to a wide variety of uses because of the many different additives it can be combined with to produce different grades with significantly different material properties. What is it Used For? Nylon is a good choice for a variety of applications, such as extruded or injection molded parts for Automotive, Aerospace and Food Service to Commercial and Industrial use. It is especially good for components in the engine compartment of vehicles because of its strength, temperature resilience, and chemical compatibility. What does Hi-Tech Profiles use Nylon for? We maintain inventories of both Nylon Bushing Stock and Nylon Hollow Rod in standard 5’ lengths from ¼” through 2½” OD with ID sizes ranging from 1/8” to 2¼” and Type H Pressure Tubing and Type T Pressure Tubing. 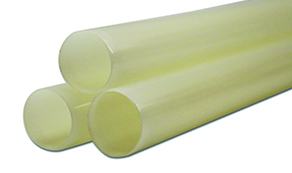 We will also stock Nylon 12 Flexible Tubing and issue custom quotes for tubes and profiles in various other lengths and sizes. We further produce Sheet and Strip products in Nylon.